Hungarian Film, "Son of Saul," Wins Oscar! 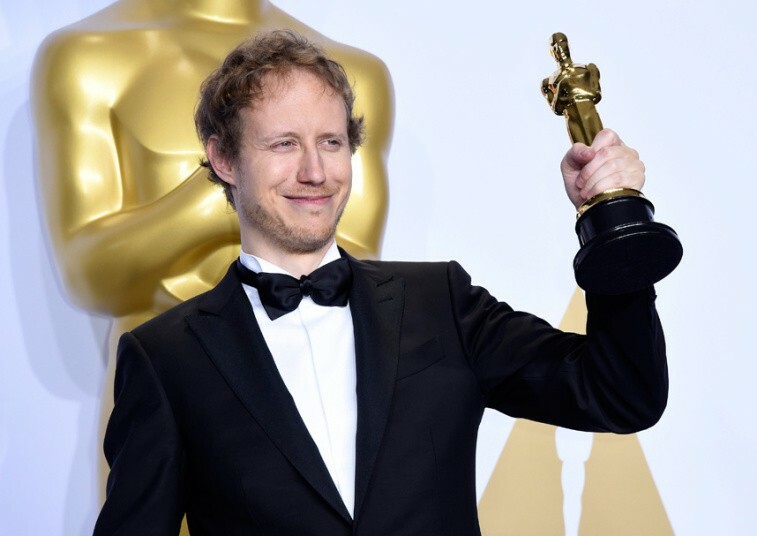 Hungarian Film, "Son of Saul," Wins Academy Award! 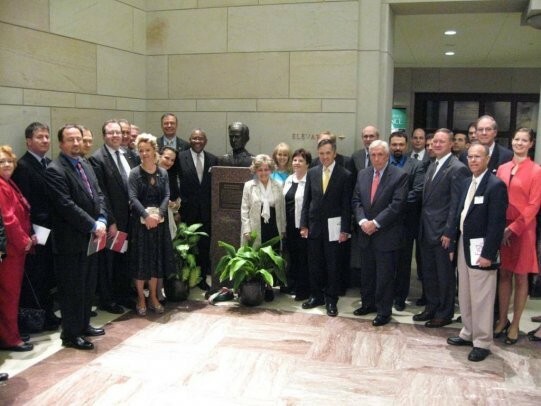 12/2/2015: AHF Leaders attend Son of Saul Premier in Washington, D.C. AHF members Irvin Varkonyi and Atilla Kocsis attended the Premier of Academy Award-winning Hungarian film, "Son of Saul," in Washington, DC. In attendance were the current Hungarian ambassador, H.E. Reka Szemerkenyi, along with former ambassador Andras Simonyi and other dignitaries from the community. Good movies summon up worlds. 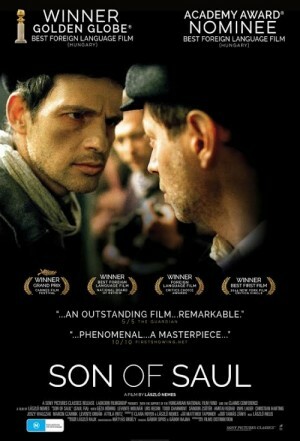 “Son of Saul,” a great movie and a debut feature by László Nemes, summons up a world we may think we know from a visual perspective we’ve never encountered—the willed tunnel vision of a Jewish worker in a Nazi death camp. This point of view is doubly protective. We’re spared the worst of Auschwitz’s horror because the protagonist, a Hungarian named Saul Ausländer (a phenomenal performance by Géza Röhrig), is determined to keep what’s left of his sanity by focusing his gaze, and for a while his mind, on the ground in front of his feet and on whatever tasks may be at hand. His vision broadens only after he comes upon the corpse of a boy he chooses to think of as his son. That’s when he sees a chance to perform a moral act in the midst of the madness, and when Mr. Nemes’s film attains an ineffable beauty. Tracking Saul from behind emphasizes his sense of purpose, as evidenced by his relentless forward motion, though it offers no clues to his inner life. Yet seeing him from the front isn’t much more revealing, since his gimlet eyes and impassive features barely react, if at all, to the bodies around him. Not until, that is, he fixates on one of them, and on the idea that he must save the boy’s body from the autopsy doctors, then from the flames, then find a rabbi to say Kaddish and provide a proper burial. Suddenly Saul is part of the frantic commotion that he has previously helped to oversee. Buying off guards with “shiny”—valuables taken from the dead—he becomes a man possessed. Is he also delusional? Has he begun to believe that he has found his literal son, and does it matter? One thing that matters greatly to his Jewish comrades is that his obsession deflects him from playing his appointed role in a planned escape. “You failed the living for the dead,” he’s told scornfully. “Son of Saul” poses a host of questions without answers, and that accusation goes to one of them. But Saul’s choice can also be seen, in the film’s radiance, as faith giving meaning to life. Read more about Hungarians in Film and Media on AHF's "Nobel Prize Winners and Famous Hungarians"
Poland, who shared a border with Hungary for centuries, and the United States never ratified the treaty. At the time President Wilson said: “The proposal to dismember Hungary is absurd” and later Sir Winston Churchill said: “Ancient poets and theologians could not imagine such suffering, which Trianon brought to the innocent.” Others warned that a fragmented, weakened Central Europe and dismembered Hungary would open the door to Soviet expansionism. We are sad to report that they were all right. Hungarian populations declined significantly after forced removals such as the Benes Decrees and other pograms, the effects of WWI, and Trianon in 1920. With continued pressure and discriminative policies such as the 2009 Slovak Language Law, the Slovak Citizenship Law, discriminatory practices in Rumania and Serbia, this trend has continued over the past 90 years. [Read more] about the Treaty of Trianon.